A search and rescue mission has found three missing Alberta snowmobilers on a Revelstoke, B.C. mountain. A search and rescue mission has found three missing snowmobilers from central Alberta on a Revelstoke, B.C. mountain, a family member told CBC News. 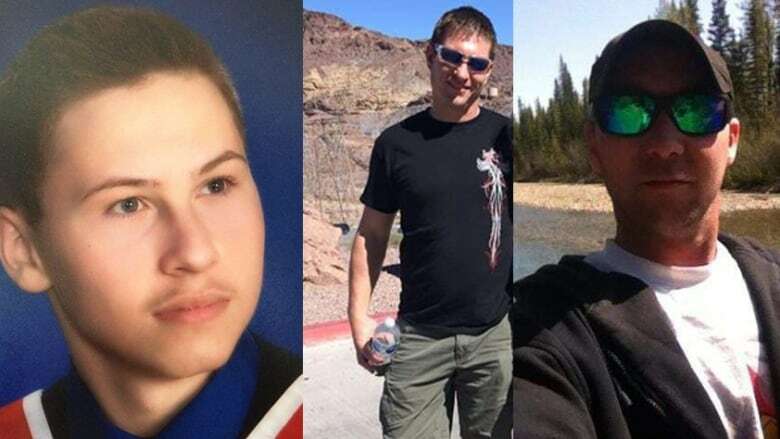 Todd Kennedy, 45, his son Braydon, 21, and family friend Ryan Pyper, 40, went missing during a snowmobile trip. Denise Kennedy said she got a text from her son just before 4 p.m. Saturday. "All it said was 'we are alive', which was good enough for me," she said. Kennedy said the men were found walking on a mountain trail without their snowmobiles around 2 p.m. A search and rescue team then brought them to a nearby cabin to warm up. Kennedy said her husband and son told her no one was injured when she spoke to them by phone Saturday evening. The three men were heading down the mountain Friday evening after a day on the trails. They ended up at a river, which is when they realized they had taken a turn sooner than they should have. The snow was deep and they couldn't get back to the trail with their snowmobiles. Kennedy said that's when the men decided to hunker down and build a fire to stay warm because it was getting dark. "They went into survival mode to make it through the night," she said. They set out on foot to find the trail around 9 a.m. Saturday morning. The rescue team found them five hours later. "Early today, I didn't know what the outcome was going to be," Kennedy said. "I consider myself really blessed that my son and my husband are alive." The trio left central Alberta on Thursday and were expected to return home Saturday or Sunday, said Pyper's wife, Rozanne. When she didn't hear from her husband Saturday morning, Pyper began to worry. "Your mind goes through all the different scenarios," she said. "Honestly we're trying to just keep things positive and hope for the best today that all three of them come off the mountain alive and well." The trio were last heard from Friday morning at 7:40 a.m., when Braydon posted on Snapchat a photo of one of the snowmobiles, she said. Ryan was also in contact with his mother-in-law, said Pyper. When hotel staff confirmed they weren't in their rooms Saturday morning, Pyper reported her husband missing to B.C. RCMP. She also notified the Revelstoke Snowmobile Club, who confirmed to Pyper that Ryan's truck was still in the parking lot at the base of Boulder Mountain in Revelstoke on Saturday. A search and rescue operation, including a helicopter and an unknown number of "boots on the ground" was dispatched, Pyper said. Poor visibility because of heavy snow made it difficult for the search and rescue mission, said Davidson. Revelstoke was under a winter storm warning as of 2:30 p.m. MST Saturday and "hazardous winter conditions" were expected in the area, according to Environment Canada's website. This wasn't the first snowmobiling trip for Ryan, who is described as an avid outdoorsman by his wife. Both Ryan and Todd have travelled on similar trips together in the past, and both families would often camp together in the summer. She said her husband always travels prepared and this trip was no different. She said the men had four snowmobiles with them, with the fourth being used as a spare in case something went wrong, Pyper said. The trio will spend Saturday night in Revelstoke before returning home on Sunday.